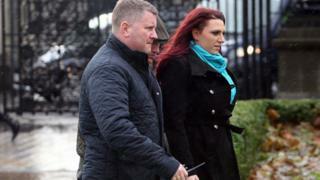 The deputy leader of far-right group Britain First has been re-arrested after appearing in a Belfast court over a speech she gave in the city. Jayda Fransen, 31, of Anerley, south-east London, was in court over two charges relating to behaviour intended to or likely to stir up hatred. Her lawyer told the court that she intended to plead not guilty. Britain First leader Paul Golding, 35, was also arrested outside the courtroom before the hearing. Mr Golding was accompanying Ms Fransen to the hearing. The police confirmed they have arrested a 35-year-old man as part of their investigation into the “Northern Ireland Against Terrorism” rally in August. It is believed Ms Fransen has been re-arrested over social media posts she made from a peace wall in Belfast on Wednesday. Peace walls are used to separate Catholic and Protestant residents in areas where tension between the two communities can run high. But instead of accompanying her into the courtroom, Mr Golding was detained by detectives and taken to a nearby police station. Ms Fransen spoke only once in the dock – to confirm she understood the charges against her. 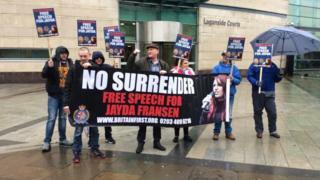 A small group of supporters were in Belfast Magistrates Court – and after Ms Fransen was re-arrested, they staged a short but angry demonstration, holding placards and chanting in front of the media gathered outside the building. The police confirmed that a 31-year-old woman had been arrested as part of an investigation into “an incident at a peace wall”. Ms Fransen, whose anti-Islamic social media posts were retweeted by US President Donald Trump in November, appeared in the dock at Belfast Magistrate’s Court on Thursday. The court ordered her not to go within 500m of any demonstration or parade in Northern Ireland as part of her release on bail. A detective told the court that a “Free Speech for Jayda” rally was planned to take place last weekend and was postponed because of snow. “We have concerns there would be further offences and also concerns about public order,” the detective said. Prosecutors has also sought curbs on Ms Fransen’s social media use but the judge expressed doubts over whether the court’s jurisdiction extended that far. Ms Fransen is due to return to court on 9 January. Is Iceland’s Katla Volcano Really About To Erupt?